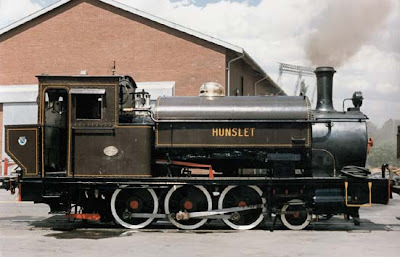 HUNSLET was built by the Hunslet Engineering Company, Leeds, England in 1902. It is not known who ordered the locomotive. However, it is known that she was shipped from the factory to Durban for Roger Jenkins, a firm of mechanical and electrical engineers acting as agents for Hunslet. The Victoria Falls and Transvaal Power Company Limited (VFP) bought Hunslet in 1912. It is not known from whom the VFP bought Hunslet. Hunslet was used to haul coal trains from Modrea railway station to Brakpan power station, a distance of 4km. From 1922, Hunslet served at Vereeniging power station. Hunslet’s nickname was "Mitzi". In May 1953, while stationed at Vereeniging power station, Hunslet was loaned to Vaal power station until Vaal’s DUBS locomotive was repaired. Hunslet was returned to Vereeniging power station in January 1954. In 1958 Hunslet was loaned to Grootvlei power station, then under construction, to serve as a stationary boiler for steam-cleaning the boiler tubes and steam pipes of the power station’s No 1 boiler. Hunslet was returned to Vereeniging power station again, until the station closed in 1967. With the closure of Vereeniging power station, Hunslet was sent to Rosherville power station. A dedicated locomotive maintenance team, located at Rosherville central workshops, kept Hunslet in first-class condition. In accordance with conditions first stipulated in the Power Act of 1910 and included in the Electricity Act of 1922, all assets of the VFP were expropriated and taken over by ESCOM in 1948. ESKOM was formerly known as the Electricity Supply Commission (ESCOM). Originally, Hunslet had coal boxes on each side of the cab. But as these proved to be inadequate, a new coal-bunker was constructed at the rear of the cab in 1946. The old coal boxes became tool-boxes. In summer, as the water in Hunslet’s saddle tank became heated, it caused the two injectors to dribble. This indicated that the water did not condense the steam quickly enough. No such problem was experienced in winter. Hunslet is on permanent loan from ESKOM to the South African National Railway And Steam Museum also known as SANRASM in Krugersdorp. A ride on this steam locomotive is still possible. Enthusiastic volunteers operate the museum. Their efforts ensure that Hunslet "steams" for the public approximately twice each year. This information on HUNSLET comes from research material compiled by Mr. Rick Searle, a retired ESKOM employee.